Shields the wound from liquids and micro-organisms. Maintains a moist healing environment while allowing excess fluid to evaporate. Minimizes disruption of the healing field due to its soft, light-weight, nonbinding material. Fits loosely to allow a wide range of motion during therapy. Saves time during dressing changes. 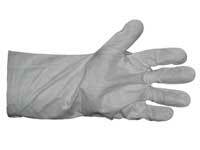 The gloves are sterile, single-use, and available in three sizes. Mittens are available for children, and infants. "Nurses and therapists agreed that dressing changes were quick and easy and that the gloves provided greater range of motion and function in the hands. Patients also expressed a preference for this method of treatment."